Note to readers: This article contains images of dead whales. THREE BEAKED WHALES were found dead in three separate locations in Donegal and Mayo over the weekend. The Irish Whale and Dolphin Group has described the strandings as “highly unusual” for the deep-diving mammal. The IWDG reported that in Donegal, one whale was found floating in Sheephaven Bay and another on Gola Island, while in Mayo the third whale was found at Tirraun on the Mullet Peninsula. According to the IWDG, three or four strandings of the animals, which are known as Cuvier’s beaked whales, in one year is relatively normal but “it is highly unusual to have three recorded in separate locations on the one day”. The cause of death is not known in any of the strandings but it is believed that all three of the animals had been dead for several days and were in a poor condition when they washed up on shore. 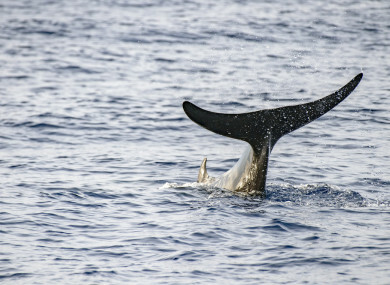 “Cuvier’s beaked whales are a deep diving species and have previously been found to be particularly affected by loud underwater man-made noise such as sonar. “It is interesting to note that another deep-diving species, a long-finned pilot whale, was also reported dead recently on Cross Beach, Co Mayo, close to one of the stranded Cuvier’s,” the IWDG said on its website. In a study published in 2014, scientists reported that a Cuvier’s beaked whale they had tracked swam to the depth of 2,992m and stayed underwater, without taking a single breath for 138 minutes. The number of dolphins and whales washing up on Irish coasts reached record levels last year with 263 cetacean strandings reported around the country. But according to experts that record is likely to be surpassed as 175 strandings have been reported so far this year. Mick O’Connell, coordinator of the IWDG Cetacean Stranding Scheme says that figure is due to the high number of common dolphin deaths this year. In the January and February, 57 dolphin deaths were reported, rising from 35 for the same period last year. “To put this in some perspective, 10 years ago, it would have been normal to have about 25 strandings by the end of February, of which 3 would have been common dolphins,” O’Connell said. Between December 2014 and April 2015, 11 Cuvier’s beaked whales were stranded on the Irish coast around the same time that a similar number were recorded in Scotland. The connection between the events or the causes of death were not established. Email “Three beaked whales wash ashore in 'highly unusual' strandings ”. Feedback on “Three beaked whales wash ashore in 'highly unusual' strandings ”.